Head chef Mihkel Kalbus’ has one primary principle when creating new menus and dishes – everything has to be delicious. And not just in a simple sense, but in a profound one too. Every element on the plate has to have a clear flavour, all the components have to work together and all these flavours must complement each other. Flavours are not sacrificed on any account. The most prominent sources of inspiration for the head chef for the past 10 years have been local quality produce, familiar Estonian flavours and an enthusiasm for modernising popular historical dishes. 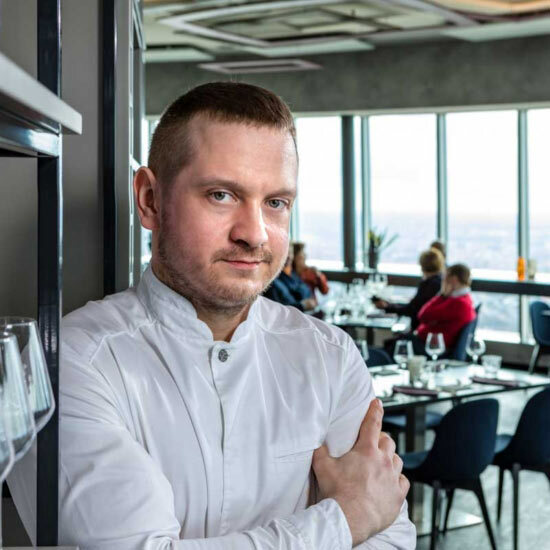 Before joining the TV Tower family, Mihkel has managed the kitchens of Farm and café Rukis, and participated in creating the menu for Estonia’s largest restaurant Rae Meierei and founding its accompanying cheesemaking factory.